Manchester City's Fabian Delph and Phil Foden will be sweating on team news for Saturday's visit of Fulham, with Gareth Southgate's England warning ringing in their ears. The pair have found it difficult to break into Pep Guardiola's side this season, with Delph yet to play in the Premier League and Foden limited to eight minutes off the bench in the recent 6-1 thrashing of Huddersfield. The issue of limited chances for home-grown stars has been thrust into the spotlight after the pronouncements of England manager Southgate this week. Southgate has made it clear that his policy will be that only players featuring regularly for their clubs will be considered for the national team. That warning is particularly timely given that City face what should be, in theory at least, one of their easier fixtures of the campaign as the newly-promoted London club visit the Etihad. "I was at Manchester City against Huddersfield and you think: 'Well, OK, it is a game where Foden will play'," said Southgate. "But actually, if I am Pep, I have other players, senior players, who I have to get up to speed because they haven't had many match minutes." "The landscape is what it is and I understand the difficulties club managers have," he added. "They have to try to win matches. It is not as straightforward for Pep as: 'Oh, I'll just give Phil a game.'" Delph, 28, has won seven international caps since he last kicked a ball in anger for City, in the final game of last season. Given Delph's more advanced standing as one of the older players in a young England squad, Southgate is watching his situation, along with that of Chelsea's Ruben Loftus-Cheek, with particular concern. "We are hoping that now we have given them some minutes they will go back to their club better prepared for when they get their opportunity and it gives them a better chance of staying in the team," he said. "They are going to have the League Cup and European football, so there's more opportunity that the squads will get rotated. "But if we are in a similar situation next month -- three weeks into the season is one thing, but seven weeks and they have not played? It is even more complicated." 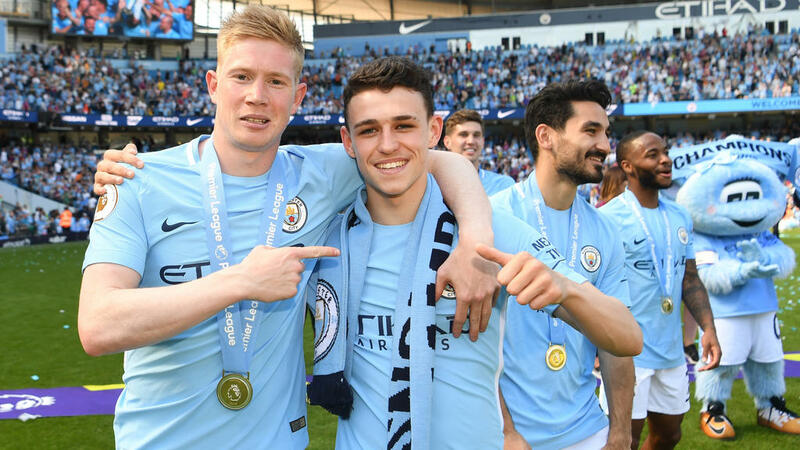 The situation involving 18-year-old Foden is just as frustrating, given that he was one of the outstanding figures in the England team that won the under-17 World Cup last season, scoring twice in the final against Spain. Reports suggested Southgate was on the brink of calling him into the full squad for the recent internationals with Spain and Switzerland only to have a change of heart due to Foden's lack of first-team football. Even an established figure such as defender John Stones found it difficult to command a regular place under Guardiola in the second half of last season. Stones suffered an injury that ruled him out for most of April but, even so, since mid-February he has played just 433 minutes in the Premier League for City and more than double that figure, almost 1,110 minutes, for the England team. Another interesting team selection issue facing Guardiola concerns winger Leroy Sane, so inspirational in City's title-winning team. He has yet to start a league game this season, having missed out on selection for Germany's World Cup squad in Russia.